For Tammie Wilcox, of Tacoma, a 40-year professional dog handler, it’s the memory of a lifetime. For Terry Warnock and Donna McDermott, of Vashon Island, it’s a dream come true. And since Champion Eyjahunda Thorarinn (call name Thorri), an Icelandic Sheepdog, became the first member of its breed to win a best-in-show at an American Kennel Club in Portland Jan. 21, the dog-show world has been abuzz. 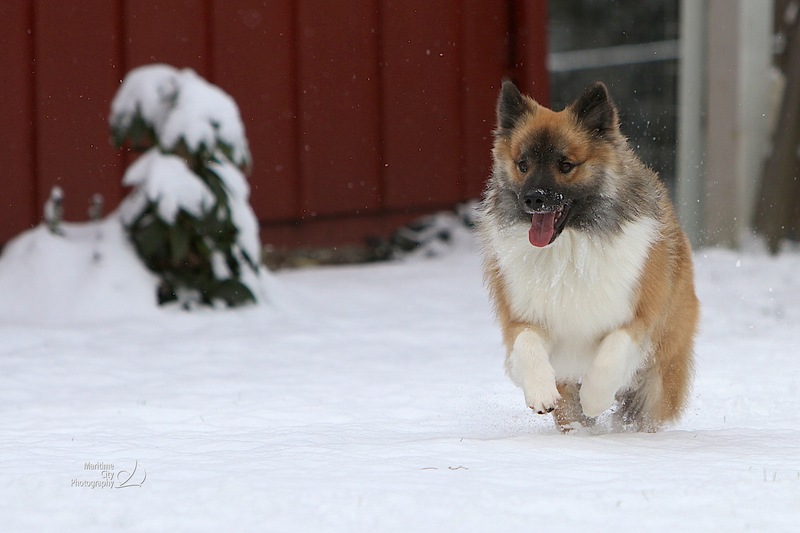 Champion Eyjahunda Thorarinn (Thorri), an Icelandic Sheepdog, frolics in the snow on his five-acre Vashon Island home. The breed is by nature very alert and will always give visitors an enthusiatic welcome without being aggressive. The breed, which numbers about 800 nationwide, was first recognized by the AKC last June and is among six new breeds to be exhibited at the famed Westminster Kennel Club Dog Show in New York City Feb. 14-15. That’s why Thorri’s win at the Dog Fanciers Association of Oregon show over an entry of approximately 2,500 and a star-studded Select Seven field that included several multi best-in-show champions, was to put it mildly, a major shocker. Thorri is one of four Icelandics owned by Warnock and McDermott, the latter who owned one as a 7-year-old when living in Iceland in 1972. Their other pair is among four Icelandic Sheepdogs entered at Westminster this year. 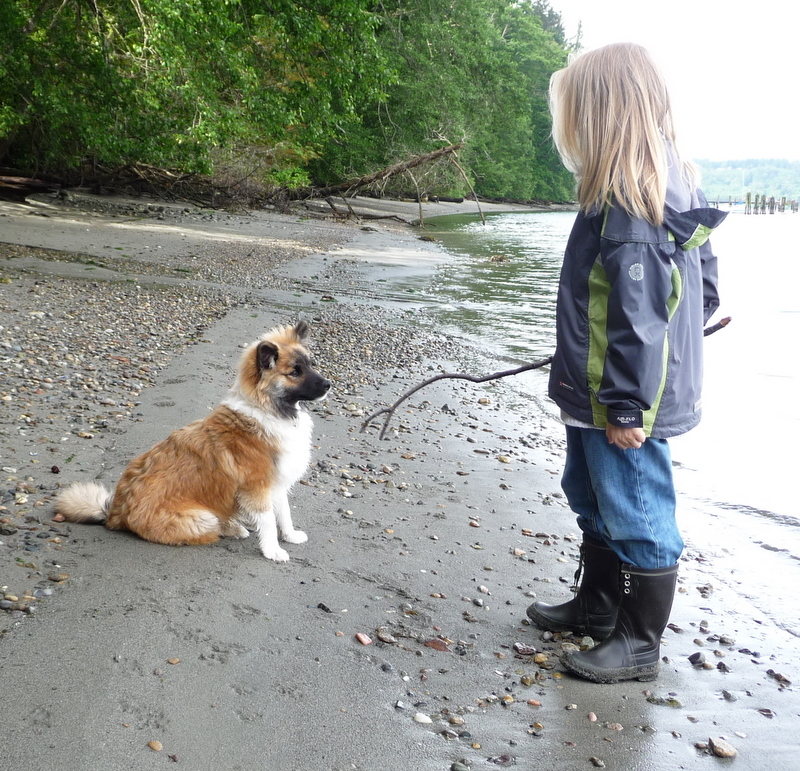 Thorri stops on a Vashon Island beach with a young visitor from Denmark. By the time the weekend was over, he earned his grand champion title. Because the bonding process between handler and dog is critical and because Warnock and McDermott prefer to keep their three dogs at home on their five-acre property, they bring them to Wilcox’s Tacoma kennel for visits a couple of times weekly simply to build that rapport. After a late autumn snowfall, he finds the white stuff very much to his liking. Wilcox is familiar with all three of Warnock and McDermott’s dogs, but recognized “tremendous potential” and a “great attitude” in Thorri early last year in their initial meetings. “A dog that is not accustomed to a show environment must learn to adapt. This means it must learn to understand what is required of it, particularly handling by judges.” In this breed’s case, plenty of inspection is part of that protocol, since the standard calls for dewclaws on all four limbs. Taking a young herding dog from the field and home environment into a ring surrounded by hundreds of onlookers and other dogs can be a daunting task. After winning breed, Wilcox went into the herding-group ring simply wanting her young companion to behave well and look good. Thorri answered both challenges “beautifully.” And then when the judge began pulling potential group placements, Wilcox made a “stupid move,” something she has never done in an almost four-decade handling career. Mission accomplished and Thorri moved on to become the second member of his breed to take a Group 1 at an AKC all-breed show. Photo by Randy Roberts. 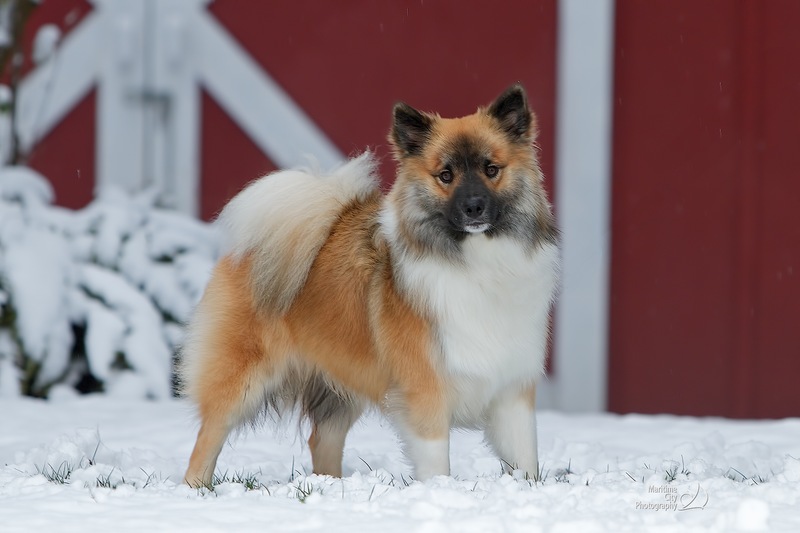 Champion Eyjahunda Thorarinn (Thorri) is the first Icelandic Sheepdog to win a best-in-show title at an American Kennel Club conformation event since the breed was recognized last June 30 by the U.S. registry. Thorri is owned by Terry Warnock and Donna McDermott, of Vashon Island, and handled by Tammie Wilcox, of Tacoma. Here the dog is shown with, from left, best-in-show judge Robert Hutton, Wilcox and trophy presenter Mary Strom-Bernard, in Portland Jan. 21. Wilcox is familiar with the ring procedure called for by best-in-show judge Robert Hutton, yet harbored no expectations against a strong field of seasoned campaigners with many bests-in-show between them. “Thorri did a wonderful free stack and moved with confidence and happiness,” she adds. After doing their job, Thorri and Wilcox waited for the others to show their stuff. 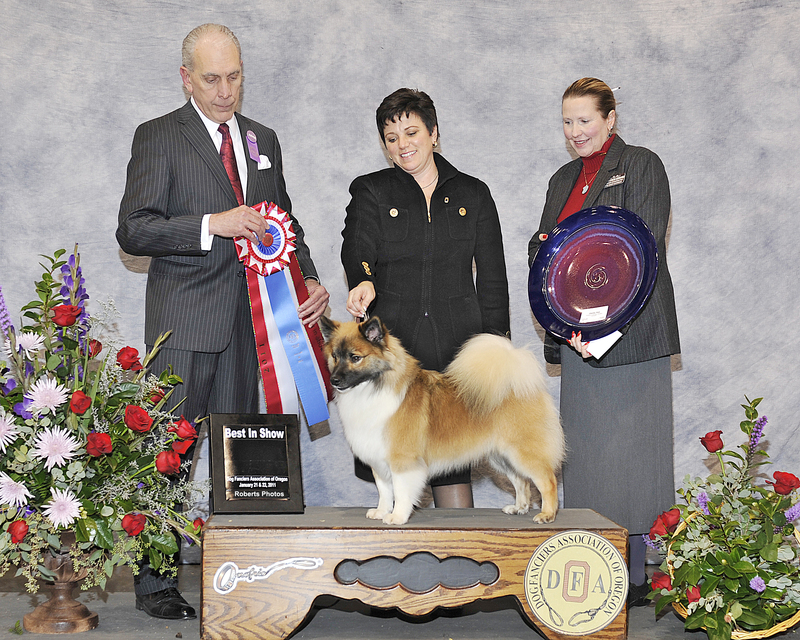 When, it came time for Hutton to present the best-in-show award, he looked over all of the Select Seven, and announced, ‘Mam, you win best in show.’ Wilcox looked around for a split second and realized she was the only woman handler in the ring. “I was ecstatic,” she adds. For Wilcox, this ranks as one of her most memorable wins ever and puts her in the history book as the first handler to win an AKC best-in-show with an Icelandic Sheepdog. “I don’t know how I can top this. I just happened to be the person at the end of the leash with one terrific dog,” she says. What does Torri’s triumph mean for the breed? But Torri is a family pet, cherished friend and farm dog first of all, McDermott concludes. The amount of his campaigning nationally is yet to be determined. For now, everyone is simply savoring this special win. Wilcox gives full credit, however, to Warnock and McDermott’s commitment to educating judges and the public about this breed that came to Iceland with the Vikings in AD 874-930 and nearly met its extinction there in the 1950s. Concerned supporters of the breed eventually formed the Icelandic Sheepdog International Cooperation, a consortium of members from Denmark, Finland, Germany, Iceland, the Netherlands, Norway, Sweden and the United States. The organization, which conducts annual seminars, focuses on maintaining a consistent breed standard and communication internationally among members. The Icelandic Sheepdog Association of America, the breed’s parent club and only United States partner club for the Icelandic Sheepdog International Cooperation, will conduct its national specialty June 30-July 3 at the Skagit County Fairgrounds in Mount Vernon. Educational seminars and herding demonstrations are planned in addition to ring competition.